UNS – Active women bring great influence to future generations. 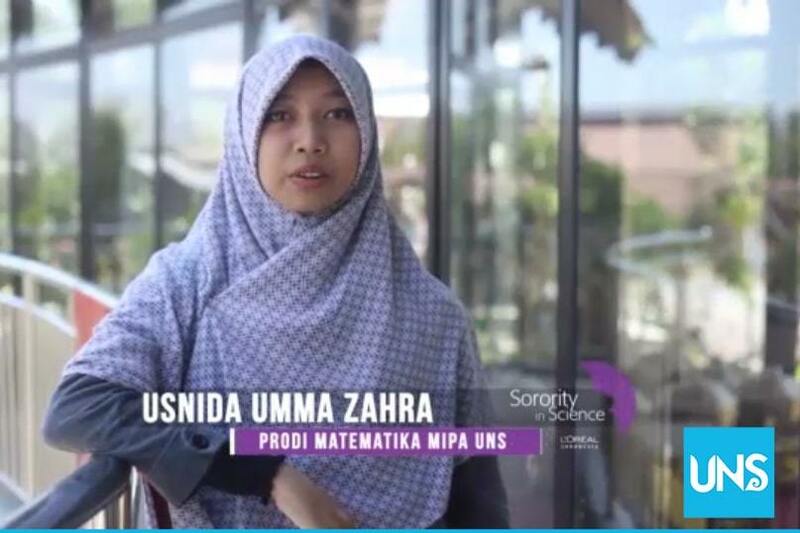 They obviously include Usnida Umma Zahra, a student of Mathematics Study Program of Mathematics and Natural Sciences Faculty of Universitas Sebelas Maret (FMIPA UNS) class of 2014. She has proven how modeling a situation through mathematical equation plays an important role to solve problems. Usnida is a grantee of L’Oréal Sorority in Science scholarship, a unique program launched on a partnership between L’Oréal Indonesia and the Indonesian National Commission for UNESCO Ministry of Education and Culture (Kemendikbud). The scholarship, worth 20 million rupiah, was for female students who were heavily into and involved in the field of science and able to escalate the imcredible aptitude of Indonesian female researchers in the future. Usnida, who also serves as the Secretary of Studi Ilmiah Mahasiswa (Student Research & Scientific Study), obtained the scholarship information from a last year’s winner. The main motivation to apply this L’Oreal scholarship was to fund her research. Usnida explained the stages of the scholarship application, which started from filling out the form, collecting documents such as letters of recommendation and transcript, and writing a 3500-word essay with the theme “Your Contribution for Science in Indonesia”. Passing the first stage selection, Usnida became one of the scholarship finalists among candidates from various majors such as Medicine and Chemistry Engineering. “I am so grateful I entered the Big 10 finalists, among Chemistry Engineering, Civil Engineering, Medicine, and Animal Husbandry students who registered,” she said. The second stage of selection was uploading a 2 minute video with to convince the juries why each prospective winner is entitled to the scholarship. Usnida said she was lucky to be assisted by a solid team, from recording, drafting, to editing. After eliminating competitors from female students throughout Indonesia, Usnida successfully was selected as one of 5 recipients of this year’s L’Oreal scholarship.